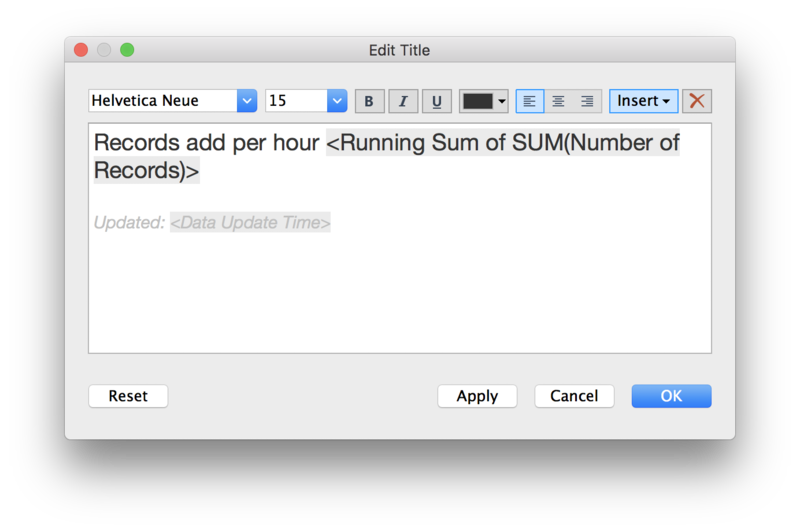 With FileMaker 17, the recipe for this connection gets updated with the addition of a version number to the URL scheme used to connect Tableau to FileMaker via the Web Data Connector. Originally when the FileMaker Data API was in beta (in FileMaker 16), the Web Data Connector URL did not include a version number. Now it does. Versioning is important, so in the future as new functionality is added, then we can use this version number to target a new API endpoint URL. And the old URL won’t break for solutions that are in production. Recently, I have been spending more time on the Tableau Community. As with FileMaker Community, it is a great place to visit, and there is a ton of immediately valuable information. There are also lots of people ready to lend a hand to a new Tableau explorer like myself. I recently listened to a talk by Jonathan Drummey about Getting Good at Tableau. Jonathan holds the real designation of “Tableau Zen Master”, and this is just one of his many great and often inspiring talks. Especially if you are starting off on your own Tableau learning journey, it’s helpful to remind yourself not to get discouraged, as there is so much to learn. One tid-bit I recently learned is: On my hosted dashboard, if I wanted to show a user when was the last time an extract ran successfully, there are ways to find and show Last Updated. I wanted to add it at the top left, under the title of my dashboard. It turned out to be a very easy thing to do. All I had to do was click on the title and then click ‘Edit’. From the ‘Insert’ choices there was one an option called ‘Data Update Time’. That was easy. I haven’t explored some of the other options, but I believe the values at the bottom are there because they are part of your dashboard. This is a bit like managing fields on a FileMaker layout. And in the ‘Edit Title’ box the value is similar to a mere field. So now we’ve both learned something new about Tableau, and hopefully we both find ourselves continuing on the Tableau learning journey. 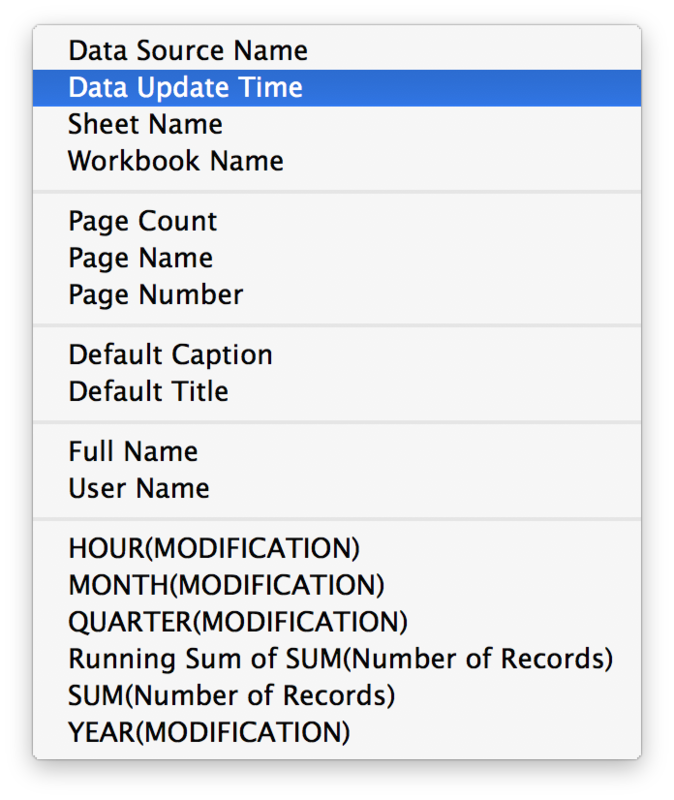 If you are used to FileMaker you might being to realize that there are many similarities between Tableau and FileMaker. Hopefully, this will give you an advantage over those who are just starting off, or simply new knowledge and skills worth learning. Enjoy! P.S. If you are diving into Tableau another possibility might be to attend TC2018 – Tableau Conference 2018, October 22-25 in New Orleans.